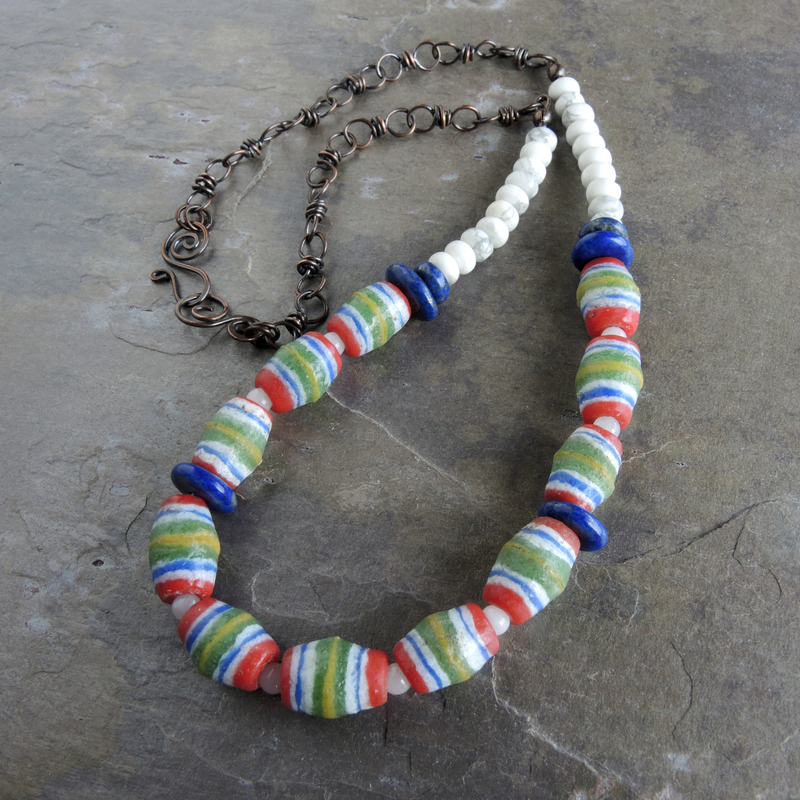 This is a cheerful and colorful necklace rich in handcrafted elements and natural stones. 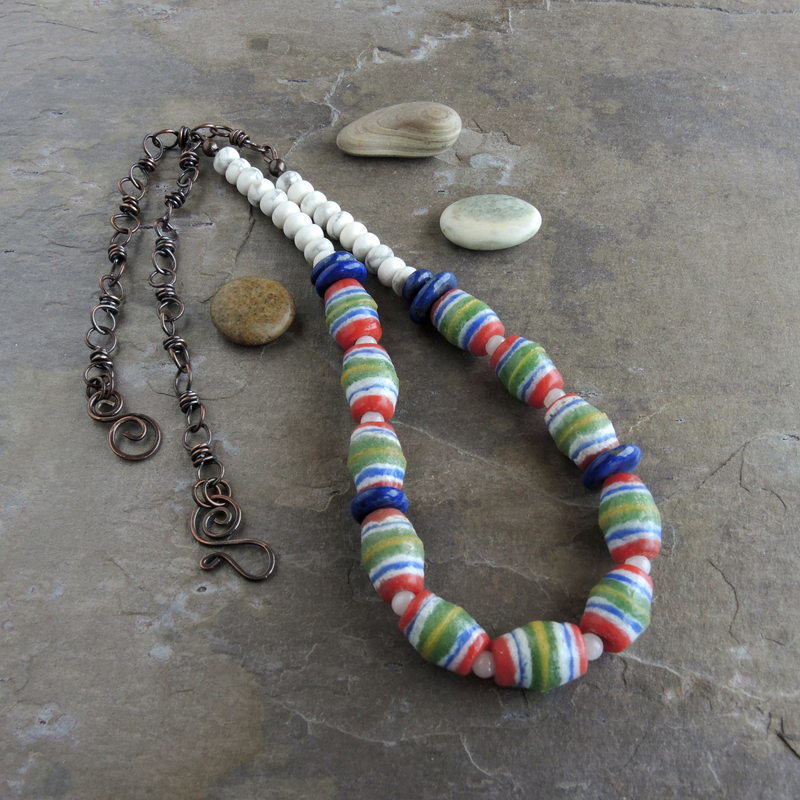 African trade beads are recycled glass beads decorated with stripes of green, yellow, blue, red, and white. I strung the powder glass beads with white quartz, blue lapis, and white howlite stones, then added a length of my handmade copper chain at the back. Handmade beads, wire wrapped copper chain and clasp ensure a made-by-hand rustic vibe. Natural stone accents in bright blue and crisp white give the piece a summery feel evoking colorful fabrics on a clothesline. The woman who appreciates ethnic arts and crafts will adore this artisan necklace. Perhaps the happy beads simply strike your fancy; this necklace is for you, too. Pick any color in the mix and enjoy wearing this brightly colored strand all year long. I was inspired by the small collection of African barrel beads I had on hand. 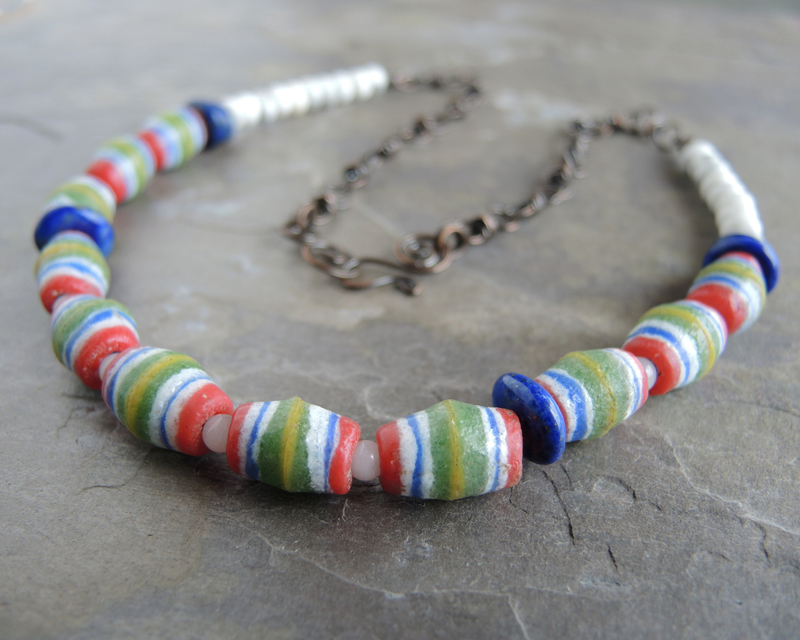 The red, white, blue, green , and yellow stripes beckoned me to build a summer necklace a nice length that could be worn on top of many neckline styles - especially the tee shirts and tanks we live in in summer. The necklace has a lovely drape and curved front that will hold its shape, achieved by spacing the Krobo beads with small white quartz rounds. Rustic tumbled stone chips of deep blue lapis separate the multicolor front from a run of interesting white howlite toward the back of the beaded section. The white howlite stones are a creamy white color with rustic grey veins giving the appearance of cracked porcelain. I gave my handcrafted copper wire wrapped chain and hook and eye clasp a dark brown patina with some hand rubbed coppery highlights showing through. All of the elements - their shapes, colors, obvious handwork, and features - blend to a rustic tribal primitive style necklace. Wear this bold necklace on its own or layered with other favorite strands you might have. The Krobo beads have an interesting story. They are from Ghana and the art of making glass beads has been used there for centuries. Broken glass, glass bottles, found glass objects are pulverized to make a powder that is then pressed into clay molds and fired in a kiln. The colorful stripes or patterns are painted using a pulverized glass slurry and the beads fired again. The surface of these powder glass beads is often a bit grainy, owing to the molds used. Sadly, I do not know the bead maker for these beads, but be assured there is a traditional artisan behind them practicing a living historical craft. You can read more about this fascinating art by researching "powder glass beads" or "Ghana Krobo" beads.